That one picture describes who he is perfectly. There are a ton of kids at the rink, all of them goofing around, and Eli is out there with them. Grinding through a power skating lesson. He was out of school for a little more than two weeks. On the ice for ten of those days, including five hours of power skating lessons. On the days he didn't skate, we played tennis. My first nickname for him is The Enthusiasm Engine. My second one, though, is probably The Grinder. The hard thing about being a grinder, though, is that there are plenty of days where you're working away and there's no positive result. That's the tricky thing about work, and it's why so many people never learn how to be good at anything: work doesn't pay off right away. It's tough, and you have to be focused and care about what you're doing, and even then, the reward is delayed by months or even years. Tougher still, the reward may not even be what you wanted. Eli grasps that as well as any kid could. It's the reason we went to the Mexican border and the Canadian border for hockey last year. As long as he doesn't want anything handed to him, I'll take him anywhere so that he can work. Having said all that about work, though, there are days where you get rewarded. Like yesterday, when Jack Campbell came to his practice. Jack Campbell was the eleventh pick in the first round of the 2010 NHL Draft (and the first goaltender taken). He was also the goalie for the U.S. in the 2011 IIHF World U20 Championship (The U.S. won the bronze, and he was named best goaltender of the tournament). 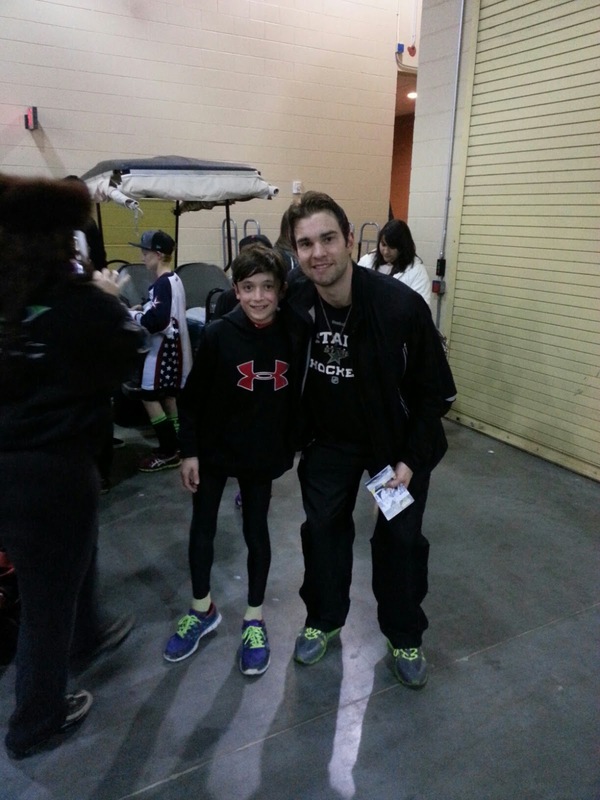 He's also Eli's favorite young goalie, by far. 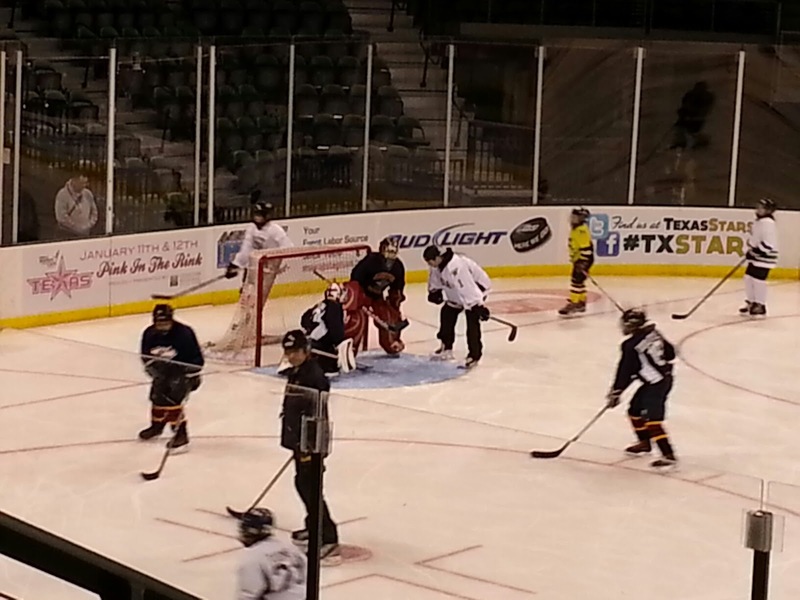 He's currently playing for the Texas Stars, and since we occasionally practice in their rink, one of our coaches asked some of the players to come to a practice. Of course, they said yes, because hockey players are like that. Jack Campbell went to the Bandits goalie camp, just like Eli last summer, and I mentioned to Eli that he should tell Mr. Campbell that, because it would give them something to talk about. So Eli skated out, and they started talking, and for all the world, they just looked like two guys hanging out. Jack showed them a few technique drills, and Eli ate them alive, because he was amped up beyond belief. When Eli started taking shots, he was ridiculously quick, like he always is, and I lost track of how many times Jack skated over and tapped Eli on the pads after a nice save. What really made a difference for all the kids is that the Stars who came to practice (Campbell, Jordie Benn, and Brenden Dillon) weren't just standing around. They were actively working the practice, engaged with the kids, and it was just great. 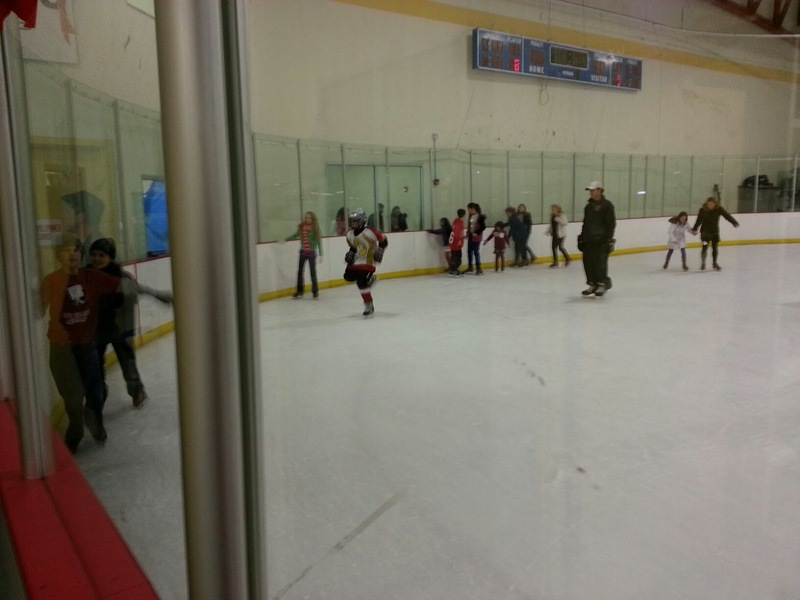 Eli would have practiced for five hours, if they'd let him, but it was over far too soon and they skated off. He had two Jack Campbell cards (including one from his Windsor Spitfires days) that he got signed, and everyone stayed and signed everything the kids handed to them. Eli talked for one more minute (really, he didn't want to leave), and as he was walking off, I heard Mr. Campbell say to him, "Hey, if you ever want me to come help, just call me. I'd be happy to." Like I said, gracious and generous. It was pouring rain as we walked out to the car, but Eli was walking about five feet off the ground, so his shoes weren't getting wet. We finally got in, and I said, "Oh, did you remember to give Mr. Campbell his birthday card?" "Oh no!" Eli said. "I totally forgot!" "Watch out for traffic in the parking lot," I said, barely getting the words out before he started sprinting back toward the arena. I waited a couple of minutes, then decided to go back and check on him. Pouring rain. When I got inside, he had just come up to the front of the signing line again, and I saw him hand the birthday card to Jack, who got a big grin on his face. That single moment made Eli's entire year, I'm sure. On the way home, Eli was talking a mile a minute for the entire twenty-minute drive. This was my favorite: "I was standing there, talking to Jack, and Jordie Benn walked by and saw us talking, and he looked at me and said, 'Sup.' Dad, I'm the 'sup' guy now!"